NOTE: - Take care not to scratch the console. 2. 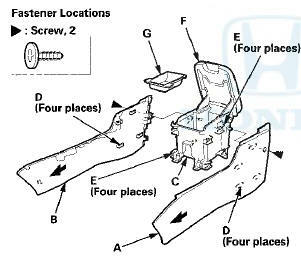 Remove the screws securing the driver's side panel (A) and the passenger's side panel (B) from the console box (C), and slide the driver's side panel and the passenger's side panel forward to release the ribs (D) of the panels from the hooks ( E l then remove the side panels. 3. For some models: Open the console armrest (F), and remove the box tray (G) by pulling it up. 4. With rear ventilation: If necessary, remove the screws, then remove the console bracket (A) from behind the console box(B). 5. With rear ventilation: If necessary, remove the screws, then remove the left side duct (A) and the right side duct (B) from the console box (C). 6. With rear ventilation: Close the console armrest. Remove the screws, then remove the box trim (A) from behind the console box (B). 7. With rear ventilation: Open the console armrest. 8. Remove the screws. Remove the left box rail (A) and the right box rail (B) by pulling them up from the console box (C). 9. Remove the E-clips (A) and the hinge pin (B) from the console armrest (C) and the console box (D). 10. 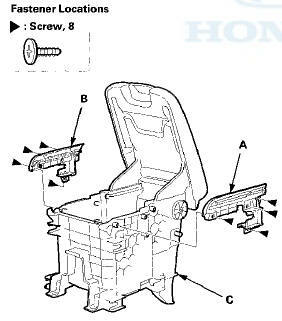 From both rear sides of the console box (A), release the opening springs (B) from the bosses (C) of the box, and close the console armrest (D). This rotates the opening springs into the notches (E) on the box. 11. Open the console armrest (A). 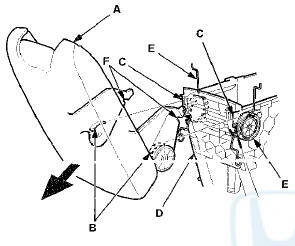 While passing the gear areas (B) of both sides through the notches (C) in the console box (D) and releasing the ends of the opening springs (E) from the notches (F), slide the armrest rearward, then remove it. Remove the opening springs from the console box. 12. Install the armrest in the reverse order of removal, and note these items: - Replace the E-clips with new ones. - Make sure the ribs of the driver's side panel and the passenger's side panel are engaged to the hooks of the console box securely.